Our minds were already whirling with cancer overload when mom's doctor casually mentioned that we should consider getting a surgeon to implant a medi port for her. What in the heck was a medi port? Seems that it's a mighty cool medical device that is implanted under mom's skin to make getting injections and i.v.s easier. So, let me back up and explain. We knew that mom was in for the fight of her life with this pancreatic cancer, and we knew that fight was probably going to involve some chemotherapy. Beyond that, we had not a clue. It had only been a couple of weeks since we had gotten the cancer diagnosis! Treatments, iv's, tests, blood draws, complications...none of that had really entered our minds yet. But the doctor knew what we didn't...Mom was facing hundreds if not thousands of needle sticks and/or i.v.s in order to fight this cancer. Ok - getting clearer. I hate needle sticks, even once a year for my annual flu shot. So, hundreds of needle sticks?! Hello, tell me more about this medi port thing. A medi port may also be called a port-a-cath or simply a port. 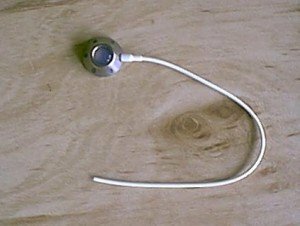 It is a device that is inserted into the chest wall just below your collarbone. The medi-port is about the size of a quarter, and has an access area for the needles and then about 5-6 inches of flexible tubing that is inserted directly into the blood vein. The port will leave a slight bump under the skin, and since mom has lost so much weight, we can actually see the tubing too. Looks a little eery, but mom says it doesn't bother her much at all. Mom's port was implanted during day surgery under light sedation. She doesn't remember a thing about the surgery. She had a small incision where they had inserted the access part of the port. It was covered with a large bandage. And then she also had a small puncture-like hole where they threaded the tubing into the vein. She had to avoid heavy, strenuous activities for a few days and couldn't shower for a week until the incision healed. And that was about it. Kind of a non-event. Sounds more overwhelming than it was. 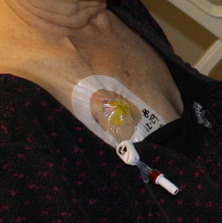 Mom's port has been used to administer her chemotherapy, fluids, anti-nausea medicine and even for blood draws. So much nicer than having to use the veins in her arms every time. 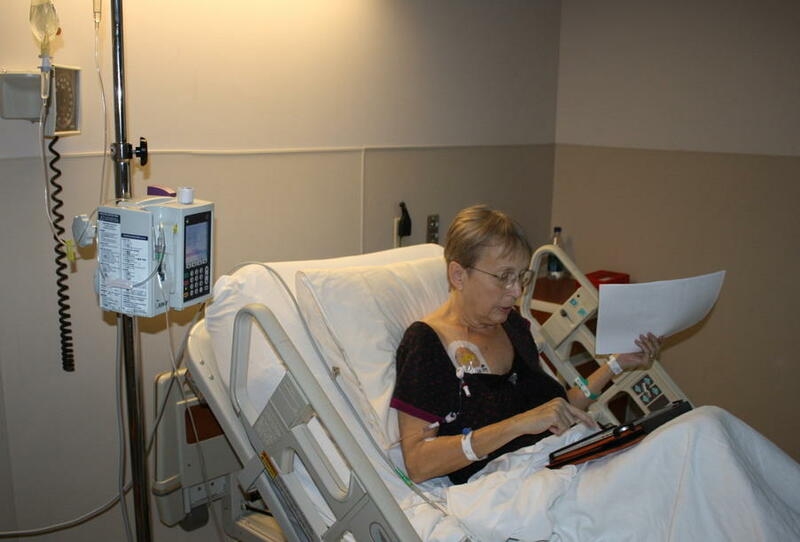 Here are a few pictures of mom in the hospital with meds and fluids attached to her medi-port. With the fluid tubing attached to the port, they cover the area with a protective clear bandage. The medi port has been a great addition to the medical technology in the fight against cancer. There's enough other ugliness, pain and misery to deal with! Having multiple needle sticks does not need to be added to the list! Mom wondered if her port would set off the security alarms at the airport when we traveled to visit her brother. Happy to say, she breezed right through! Also, a word to share on getting a blood draw from the medi port. You may find that your port sometimes doesn't cooperate. Mom has occassionally had trouble when they tried to draw blood. Often it is a simple matter of raising her arm above her head for the nurse or perhaps changing her position from laying down to sitting up or even just coughing a few times. And sometimes, they just can't get the blood draw. That's ok, it does not mean the port isn't working. Sometimes a fibrous clot develops at the access point and makes drawing blood back through port impossible, however, fluids and chemo meds can still move forward thru the port. Good to know if it happens to you! One other thing. The medi-port is not permanent. Wouldn't it be a wonderful day when the doctor tells us that chemo is no longer necessary, time to pull that medi-port. you're cancer free! I can dream...And I do!! !